Home / Opinion and Issues/ Tipping the balance: Are worker remittances to Sri Lanka really as large as we think? Worker remittances constitute an important component in the Balance of Payments (BoP) accounts in Sri Lanka. In 2017, foreign exchange earnings from worker remittances stood at $ 7.2 billion, well ahead of other major foreign exchange earners, such as apparel ($5 billion) and tourism ($3.9 billion). As a share of GDP, worker remittances accounted for 8.6 %, and more interestingly, worker remittances alone covered 96% of the trade deficit in 2017. Despite a few fluctuations, worker remittances to Sri Lanka have been growing over the years. At the same time, many developments in Information and Communication Technology (ICT) and Financial Technology (FinTech) have emerged to facilitate remittance transaction. Nevertheless, whilst simplifying and making remitting more efficient, these developments have made remittances even more complicated. This blog sheds light on the possible issues involved in reporting and recording remittances, with the view of underscoring the possible limitations in understanding worker remittances reported in BoP accounts. 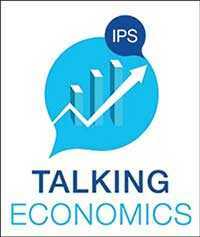 As per the latest reporting format - sixth edition of the Balance of Payments and International Investment Position Manual (BPM6), published by the International Monetary Fund (IMF) in 2009 – the previous terminology of “workers’ remittances” is now replaced by the term “personal transfers”. While the BPM5 defined workers’ remittances as current transfers by migrants who are employed and residing in new economies, personal transfers are defined as being independent of (a) the source of income of the sender, (b) the relationship between the sender and receiver, and (c) the purpose for which the transfer is made. Sri Lanka’s transition from BPM5 to BPM6 was implemented in 2014 with the publication of the BoP statistics for 2012 and 2013 (CBSL, 2014). This means that now, personal transfers are not limited to “personal transfers originating from migrants sending resources to support their relatives in their economy of origin”, but could also include transfers from the diaspora. Nevertheless, the statistics on worker remittances reported for Sri Lanka for 2012 under BPM5 and BPM6 are identical, except for change in their placement. Under BMP5 worker remittances to Sri Lanka ($5,985) was recorded under Receipts for Personal Transfers, under current transfers in BoP accounts , while under the BPM6 format the same value is recorded under secondary income, workers’ remittances. Ideally, the value under BPM6 should have increased due to the wider scope covering worker remittances and diaspora contributions. Nevertheless, they may have remained unchanged for many reasons; the two most plausible would be (a) because the numbers were not recalibrated as per the new definition but only changed in placement, or (b) BPM5 estimates of remittances mistakenly already included diaspora contributions. The second reason appears more convincing, as when SLBFE departure statistics show that labour migration from Northern and Eastern provinces during this period was not a major component, the CBSL (2012, p135) notes that “expansion of banking facilities in Sri Lanka, particularly in Northern and Eastern Provinces, contributed in attracting higher remittances in 2012”. Complicating things further, the Compilation Guide to BPM6 further notes that “not all transactions channeled through Money Transfer Operators (MTO) or commercial banks from individuals and households abroad, and between households, represent personal transfers”. Following are three examples, which on the surface looks like personal transfers, but as explained below, only one is a personal transfer. Example 1: Kamal, employed short-term in Dubai, transfers most of his salary to his account in Sri Lanka. This should be reported as a credit in primary income, under compensation of employees in Sri Lanka, and not under personal transfers. 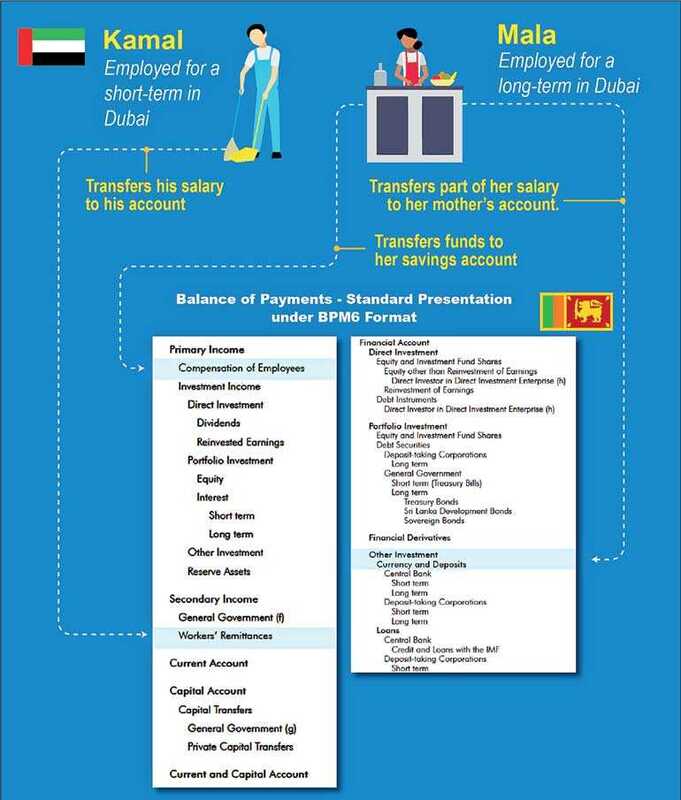 Example 2: Mala, employed long-term in Dubai, transfers part of her salary to her mother’s account in Sri Lanka. This should be recorded as a credit under secondary income account personal transfers—workers’ remittances. Example 3: Mala transfers funds to her savings account in Sri Lanka. This should be recorded under the financial account—other investment—currency and deposits. Making matters worse, in Sri Lanka, personal transfer entries in the BoP accounts are based on information provided by commercial banks that received personal transfers. In most cases, the commercial banks do not have sufficient information provided in the transaction documents to decipher between compensation for workers (example 1), personal transfer (example 2), and other investments (example 3). As such, there is a high possibility for the first and third examples above to be inadvertently compiled under personal transfers. Given the latest development in financial technology, one would think that tracking remittances would have gotten easier. Unfortunately, the capacity of technology to facilitate convoluted channeling of remittances via so many transaction points in an instant, and the related large volume of data generated in some sense have contributed to making it tedious to track down the exact location of the origin and final destination of remittances. As such, industry experts are of the view that a large amount of estimation is involved in identifying the exact origin of remittances. Moreover, the growing popularity of the ‘gig economy’, the availability of various platforms that offer opportunities for virtual labour migration, and their marriage with developments in FinTech increasingly blur the lines between payments by physical migrants and virtual migrants. In this context, even though Sri Lanka is used to associating remittances with temporary migrant workers, as explained above, personal transfers may also include transfers by more permanent migrants who have settled down in countries of destination. 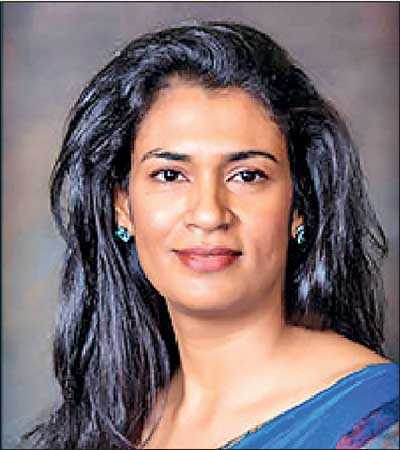 Moreover, given the latest developments in global employment and various sub headings of BoP that capture foreign exchange transfers by persons of Sri Lankan origin, the time is right for Sri Lanka to shift focus from temporary migrant workers and remittances to the broader concepts of persons of Sri Lankan origin and their foreign exchange earnings. Perhaps the upcoming Budget could be an ideal stepping stone to reflect this change in focus, by offering incentives for transfers by persons of Sri Lankan origin. Nevertheless, it is important to bear in mind that over the years, there have been several budget proposals to incentivise temporary migrant workers and their remittances, but none of them materialised to the stage of implementation. Offer a special (higher) interest rate for fixed deposits opened using transfers from persons of Sri Lankan origin (similar to the existing scheme of special rates of interest offered to senior citizens), when supporting documents can prove foreign employment, source of funds, and other pertinent information. Consider regular foreign exchange income in excess of 12 months, instead of accumulated savings, together with adequate supporting documents, as collateral for financial activities.